Save 40% off MSRP for the month of April! 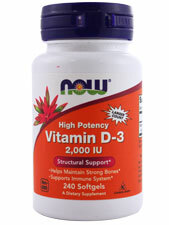 Product Description: NOW Vitamin D-3 softgels supply this key vitamin in a highly-absorbable liquid softgel form. Vitamin D is normally obtained from the diet or produced by the skin from the ultraviolet energy of the sun. However, it is not abundant in food. As more people avoid sun exposure, Vitamin D supplementation becomes even more necessary to ensure that your body receives an adequate supply. Additional Info: Natural color variation may occur in this product. Store in a cool, dry place after opening. Suggested Use: Take 1 softgel daily with a meal.